RRResearch: Do any H. influenzae competence genes protect against replication fork stalling? Do any H. influenzae competence genes protect against replication fork stalling? 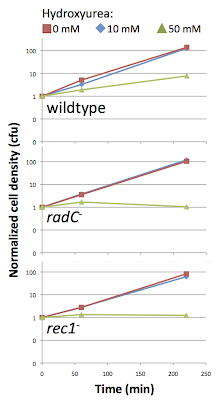 The top graph shows two mutant strains with near-normal resistance to hydroxyurea: radC- and rec1-.Growth and division wasn't affected by 10 mM hydroxyurea but was stalled by 50 mM. This effect was also seen when the cultures were allowed to grow overnight from their initial very low density (~ 4 x 10^3 cells/ml). Cultures with 10 mM hydroxyurea grew dense (turbid), and those with 50 mM were still transparent. In E. coli the competence-induced RadC protein has been implicated in replication fork stabilization; Rec1 is the H. influenzae homolog of the recombinational repair protein RecA. These strains' lower density in 50 mM hydroxyurea at 220 minutes may or may not be significant. And here's the really sensitive strains. 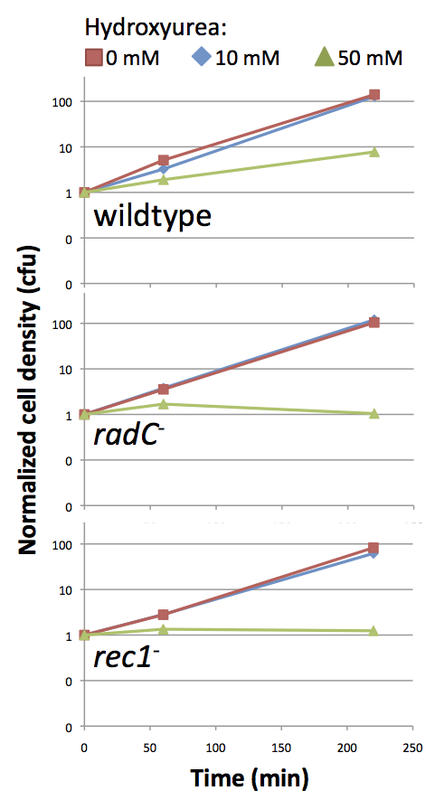 The recBC mutant was the positive control; in E. coli recBC mutants are known to be very sensitive to hydroxyurea because they cannot cope with stalled replication forks, and here we see that the most of the H. influenzae mutant cells were killed by 50 mM hydroxyurea. The 10 mM culture also failed to grow up overnight. 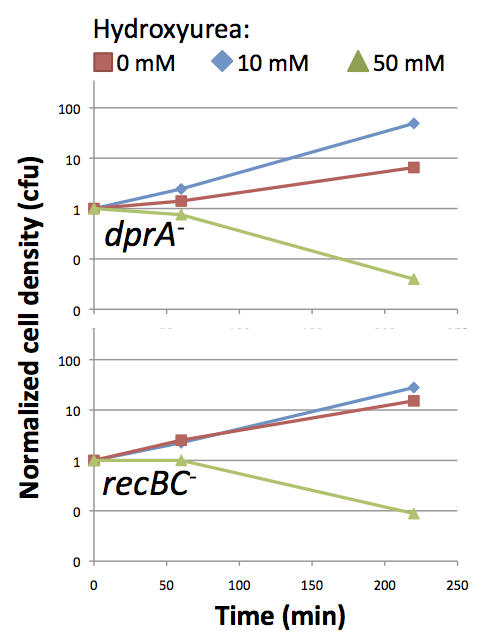 The big result: Cells with a deletion of the competence gene dprA were even more sensitive to hydroxyurea than the recBC mutant. This is important for two reasons. First, dprA homologs are ubiquitous in bacteria but no function outside of competence has been identified. In particular, in E. coli a dprA mutation had no effect when tested in various combinations with known 'recombination' mutants. Second, dprA is the poster child for genes thought to be induced in competence specifically to promote recombination. My new result suggests that other effects should also be considered. Are your graphs labelled correctly? The legend seems to suggest the green line is 10mM and the blue line is 50mM, which doesn't match with what you're saying. Oops, thanks for noticing! I've corrected the graph legends.